This project involved the creation of a brand new site for an established business in a competitive market. The website serves three main locations on the east coast of Australia and therefore had to rank in Google for multiple locations. The website needed to appeal to the construction industry user and be simple and easy to use but at the same time descriptive and content rich. The website provides multiple ways for each type of user or browser to navigate and retrieve the information they require, creating a spider web effect where most information is only one or two clicks from any location. Essential to this audience. The site can be easily skim read, perfect for busy viewers, as well as providing in-depth information, images and FAQ’s that then help them move through to action. This allows the website to do the heavy lifting and cuts down on the same questions being asked over and over again on the phone by multiple potential customers. 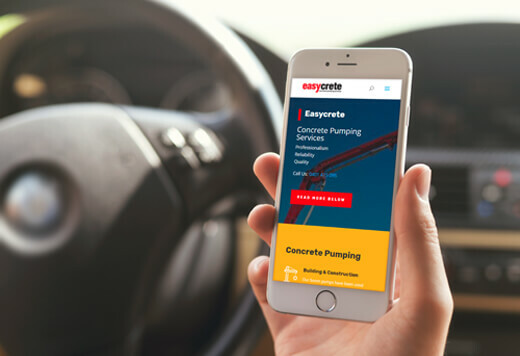 The Easycrete team can now focus on closing deals and pumping concrete. The unique situation of three locations for this business meant that we needed to ensure that each location was found individually and was able to rank and compete as its own against established businesses in each area. This was achieved onsite with clear and separate landing pages with contextualized information and contact details optimised for Google search. Google My Business and Bing Business Listings were then created for each location, along with local business citations in multiple online directories. The clear and complete details in each of these strategies mean that the website is favoured in the eyes of Google. LOOKING FOR A WEBSITE THAT SPEAKS TO YOUR AUDIENCE? Thanks Ben & Sam this is exactly what we needed. You really took the time to understand our business and create a functional and clean website that caters for our growing business for years to come. Love that each location get’s its own attention now and we can compete. We’re happy and our customers are happy.